Figure ModelRef.1 - General Properties Editing for an Object Model. The name of the XEOModel, this name must be equal to the name of file. This is the name that's used when referencing this XEO Model from other XEO Models (like when creating collection attributes, or relation attributes) or the name to be used in XEOQL expressions. The most common type is "Object", which allows you to create instances of the given Model. The "abstract" type represents an abstract Model (much like an abstract class in Java) which allows you to define a set of attributes, events, etc... which you can later reuse in concrete (i.e. type "Object") XEO Models, by extending the abstract XEO Model. The Interface type, represents an interface which Models can implement, therefore inheriting all of their attributes and becoming of that type (i.e. if Model A implements interface B, issuing a XEOQL expression of "select B" will return all instances of A, along will all other instances of Models that implement B). You cannot create instances of Models that are either Interface or Abstract. Determines whether instances of this Model are Orphans or not ( recall from the XEO Concepts). An orphan instance is one that can exist by it self, while a non-orphan instance is one that can only exist with a parent instance. Think of an invoice and an invoice line, it only makes sense for an invoice line to exist if it's inside an invoice. While a Model can be declared an Orphan/Non-Orphan using this property, relations between Models can also change that situation. See in Attributes. Any Model can extend other Model (single inheritance), inheriting it's attributes, events and methods. Any of those attributes, events and methods can be redefined in the extending Model. In this property you choose the Model to extend. A description of the Model, serves as documentation. A label for the Model, it's used throught the application in places such as the "New OBJECT_LABEL" menu in toolbars, when a label of the Object Model is displayed. The same instance would have the following CardID. The CardID for each instance is a calculated value. It's not stored persistently, as such you can change it as many times as you want while building your application. The syntax for a CardID expression is any name of a XEO Model attribute inside square brackets to refer to their value. Any other character will be interpreted as a literal text. Every Object Model is converted to a Java class that extends from the netgest.bo.runtime.boObject class. It's possible to make it that the generated Object Model extends from a different class (which, however, must extend from the boObject class), in order to do processing of something in a different way. To use that class as the base for the Object Model you'll need to type the fully qualified name of that class. A list of all the implemented interfaces by the current Model. An Object Model can declare that it implements any number of interfaces (and will inherit all of their attributes and events). TextIndex will (if active) index all simple type attributes of this Model (integer, string, date, etc...) and will index all simple types of child objects if the "appendChilds" attribute is true (and the childs are declared in the "attributes" box. If references to other Object Models are specified you can set how deep the indexer should go and if it should index all attributes or only the CardID of those instances. Non-Orphan childs will always be indexed. The active property activates the indexer for this Object Model. The deep property allows you to choose how deep the indexer will go when indexing attributes of related Object Models. Defines the Object Model's locale. The most important property is the "Language" property as it defines the language of the XEO Object Model which is used to decide if the labels for the attributes, methods, etc... are retrieved from the XEO Model itself or from one of the translation files. This section allows to choose some properties regarding the data source of the Object Model. 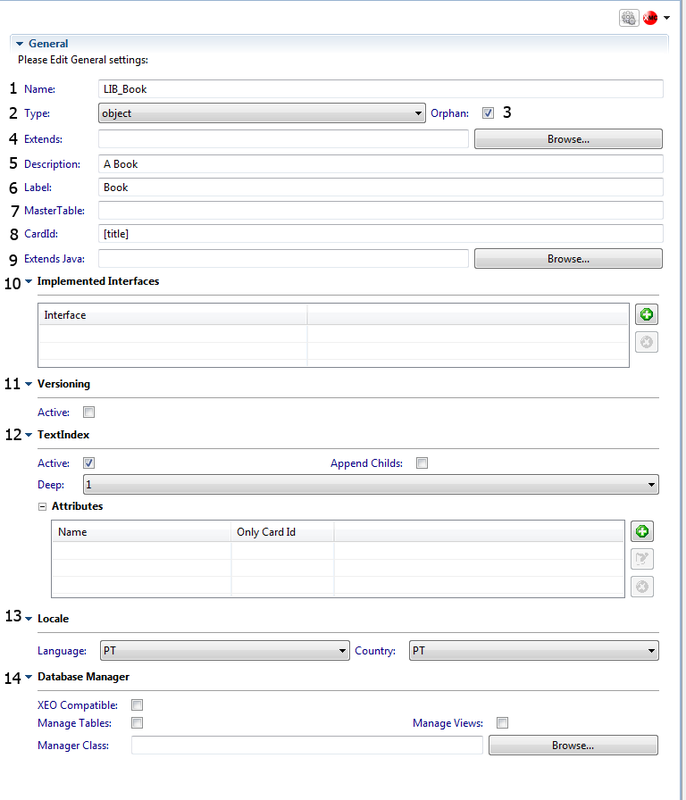 The Manage Tables option has true as a default value and if the value is false means that XEO will not create the tables for this Object Model. The Manage Views option has true as a default value and if the value is false means that XEO will not create the views for this Object Model. The Manager Class option allows you to specify the fully qualified name of a class that implements the netgest.bo.data.IXEODataManager interface which will be responsible for managing data for the instances of this Object Model. Common attribute properties - Every type of Object Model Attribute has a set of properties which are common between other types. This section explains those common properties. AttributeText - An attribute to represent a small/medium string of text. AttributeDuration - ( Deprecated) - Represents a duration of time. OPL (Object Policy Labeling) allows you to create a permission system for instances at runtime. You can configure custom rules by implementing an interface (also known as class keys), or more generic rules using attribute keys. To use a class key you must implement the ISecurityClassKeys interface and declare it in the XEO Model, like depicted in figure ModelRef.2a. To configure an Attribute Key you use the same "Add" button, but choose "Attribute Key" and then choose which type (Read, Write, Delete, Full Control) you want. Then you configure for which attribute (the attribute must represent a user, groups of users or role) the attribute key applies to, like depicted in figure ModelRef.2b, bellow. 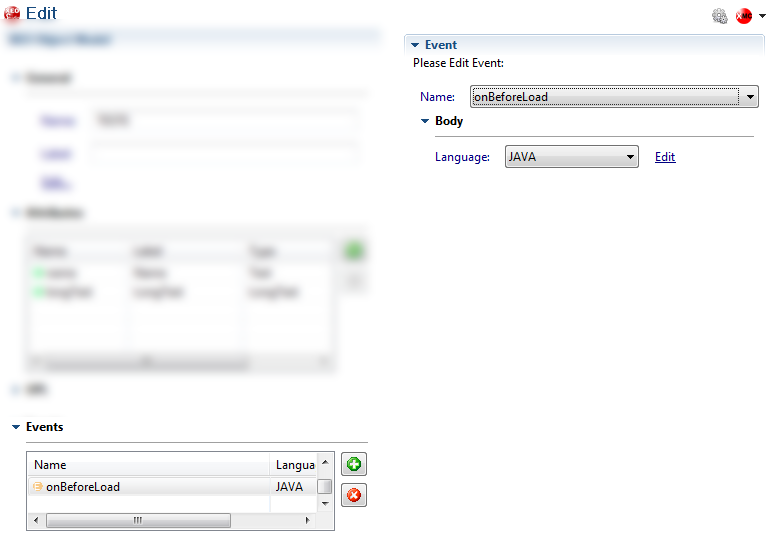 As depicted in figure ModelRef.3, the Events section allows you to define an event and open the editor to type the code of the event. Note: OnBefore* events are Java methods that return boolean. If the return value is false the action (create, load, save, destroy) will not be executed and an error will be generated. OnAfter* events are also Java methods, but are void and don't interfere with the instance. Methods in a XEO Object Model allow you to define an operation that is specific of a given entity and can be invoked either via XEO's API or using XEO Web Viewers (XEO Model methods are automatically included by default in an EditToolBar component (inside FormEdit components)). The name of the method (its identifier). This is identifies the method and allows you to invoke the method using XEO's API, or to use the xvw:modelMethod component to create a single method in a toolBar. The label of the Method. The label is displayed when the method is rendered as button in a toolbar. The icon of the method. If declared, when the method is rendered as a button in a toolbar, that button will have the icon image declared in this option. Whether or not this method should appear in an editToolBar automatically, when rendered in an edit form. TODO: Não parece ser usado, porque no boDefMethodImpl (parse do XML dos métodos) o Transaction é uma propriedade booleana que só é usada no serializeMethod() da classe boDefSerializer. Condition to declare when the method should not be rendered in an edit toolbar automatically. The condition must be set using Java code, the method must return a boolean value indicating whether the method is hidden or not. XEO Studio automatically generates a handler class for the XEO Model and creates the method with the correct signature so that you only have to create the business logic. The body option is where you create the set of instructions that make the method's logic. You must set it using Java (again, XEO Studio will create a method in the XEO Model's handler class so that you only have to code the method's logic).